The TQ Solo is a safe high-power pulsing cold laser with state-of-the-art multi-frequency emitters in a compact rechargeable portable unit. Administering effective light therapy is simple with three preset frequencies and an easy to use pictorial setup guide (see below). Although this device is used on doctor's offices around the world, it can be purchased for home use. The TQ Solo is compact and lightweight. The rechargeable lithium battery lasts up to 18 hours so pain relief is always there when you need it! This product can be purchased for home use without a practitioner's recommendation or doctors prescription. The manufacturer does not allow us to sell this product to veterinarians. They want them to buy the more expensive Vet version. Ground shipping to anywhere in the US is free (including Alaska and Hawaii). 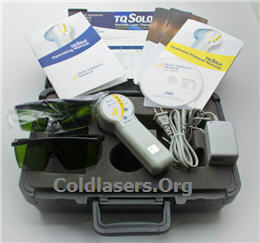 This system is not for use in Canada, here is the Health Canada Approved Version of the TQ Solo. 1. 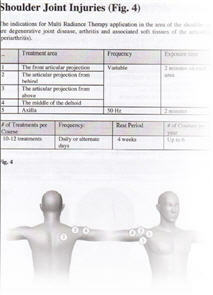 Locate your treatment area indicated in the pain-relieving guide. 2. 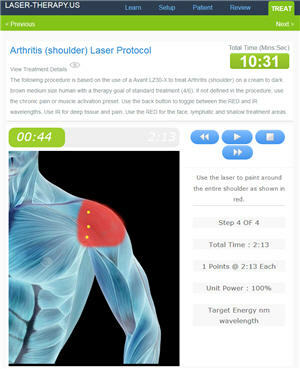 Turn on TQ Solo and select the frequency recommended by the pain-relieving guide. 3. Press the start button and press TQ Solo over the treatment area, as illustrated in the manual. There are 3 standard modes of operation for the TQ Solo. The protocol manual includes recommendations for treatment areas, TerraQuant Setup, treatment times, and treatment course variables: treatments per course, treatments per day, rest intervals, and max treatments per year. Our TQ Solo Package is so flexible, it is an excellent supplement to existing natural healing treatments and perfect for both home and office therapy. The protocol manual includes recommendations for treatment areas, TerraQuant Setup, treatment times, and treatment course variables (treatments per course, treatments per day, rest intervals, and max treatments per year). Our TQ Solo Package is so flexible, it is an excellent supplement to existing natural healing treatments and it is perfect for both home and office therapy. If you really study lasers, you know all the highest-end lasers have digital protocol libraries (like the LiteCure Compass) that use a computer to dynamically adjust to each patients requirements. Now this same technology is available for every system sold from ColdLasers.Org. This is not just a printout of generic protocol like you get form some low-end laser companies. Every TerraQuant TQ Solo system comes with a web app (image at the left) that can run on a computer, tablet or phone. This tool follows the best-practices of adapting the protocol for patient size, skin color and therapy goal to creates step-by-step custom therapy plans for over 200 conditions for humans, pets and horses. 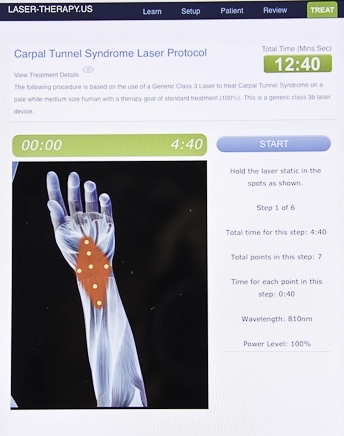 The system includes a therapy timer to tell users exactly where to use the laser and how long to use it for best results. It also includes resources that trace back to books and studies about using laser to treat each specific condition for further research. The "cookbook" protocols take all the stress and guesswork out of finding the optimum energy target for a variety of conditions. You can also buy advanced protocol directly from the manufacturer at $30 per protocol. That puts the value of the protocol library at $4500 and it is included free with every system. 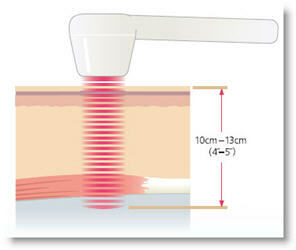 Click here to see how to the 3 standard modes of operation for the TQ Solo to treat a wide variety of conditions..
1. Super Pulsed Laser (905nm) produces a high power level of impulse light at a billionth of a second. It is the high power during each pulse that drives the photons, or light energy, to the target tissue, up to 10 - 13cm (4 - 5 inches) deep. The TerraQuant's high peak power of up to 50,000mW creates a higher photon density, delivering the highest concentration of photons for healing and providing the deepest tissue penetration. 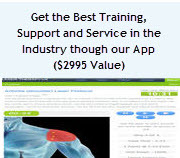 Super pulsed laser strongly influences pain reduction, the improvement of microcirculation and increases cell metabolism in the form of ATP production. Working synergistically, the multiple radiances of the TerraQuant TQ Solo create the optimal biological environment for accelerated healing and pain relief. The use of the preset frequencies, allows clinicians and home users to control the depth of the therapeutic energy from the surface up to 3 inches deep. 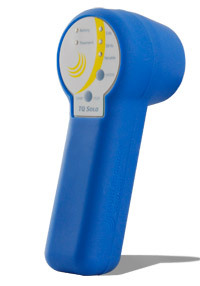 The Terraquant TQ Solo Emitter Laser System is unlike any other handheld laser systems. In addition to being FDA cleared, this product delivers exceptional power and coverage area to accelerate treatment. With a combination of 3 different wavelengths of energy, the TQ Solo has some of the best coverage in the industry.